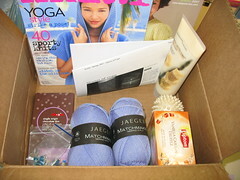 I got my package from my Knitters Treat pal! Vanilla Caramel Truffle tea which I can't wait to try. Warm Vanilla Sugar Body Cream - yum. 2 skeins of Jaeger Matchmaker - a merino 4 ply in a gorgeous periwinkle color. 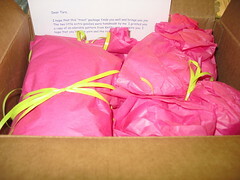 So - Michele - thank you so much!